Africa like every other continent, participated in the early epochs of the extension of man’s control over his environment as they increasingly showed their ability to live a more satisfactory life through exploiting the resources of nature. However, this political system was truncated and dominated by the European imposed political system. Hence, the nature and character of the African state remain problematic and its role in promoting sustainable development is far from being resolved. The post-colonial state in Africa is akin to the colonial state in the area of authoritarian, divisive, predatory, exclusive politics, and has been an instrument in the service of the dominant capitalist class. Development is a multi-dimensional phenomenon that encompasses all spheres of life. No society claims to be developed when the quality of life of its people is not assured. State security can be seen as National Security which is referred to as the requirement to maintain the survival of the state through the use of economic, diplomatic, power projection and political power (Free Encyclopaedia, 2003). State security encompasses a broad range of facets, all of which impinge on the non-military or economic security of the nation and the values espoused by the national society. Apparently, state security entails the possession of economic security, energy security, political security, human security, environmental security, social security, among others. Violence on the other hand, is generally defined as having the intention to harm or damage something (Encarta dictionary, 2009/2010). The simple definition of security “as feeling and assurance of being protected” can only be understood as an antithesis to violence. The application of violence, however, is not restricted to Africa, but while others are thought to have adopted measures in curtailing the causes. Africa seems to be unable to chart this same way. The modern state monopolizes power in order to maintain effective control over its citizens. This rests on the right to apply physical coercion. The nation-state concept is very important in modern politics and government; described as a political apparatus; it is recognized to have sovereign rights within its borders of a demarcated territorial area, able to back its claim of sovereignty by control of military power. Thus, the nation state is seen by some as “an organisation of violence that serves the interests of all” (Ebuley, 1995). The appliance of force by the modern state has often been used for social control. The modern state with all the necessary characteristics, however, rarely exists in Africa. Africa of today is made up of nation states with boundaries set to suit the interest of the past and present colonizers. Not only the boundaries, but invariably the systems and processes of government of the colonized areas were and are still manipulated and unwantedly exploited. Most African states have experienced different forms of conflict rooted in both internal and external factors since their independence in the late 1950s and early 1960s. These conflicts include : political and electioneering conflicts, socio-economic agitations, ethnoreligious crises, cultism, ethnic militias, terrorism, boundary disputes, criminality and organized crimes. These problems individually and collectively constitute threats to peace, security and development of the continent. The struggle to secure the most basic necessities of life like : food, shelter, clothing, fuel and medicine important to the attainment of physical and national security are important towards overall peace and development. Social unrests arising from the absence of such basic human security can indeed lead to security problems and violence. This is manifested by the recent social unrests in various African countries due to the failure of government policies to provide or manage the basic human needs of their citizens. To illustrate, there is civil strife in Egypt that ended with the enthronement of Morsi as president, in Tunisia. Ben-Ali was removed through a popular uprising; violent and armed insurgency led to the change of government in Libya; there is no peace in Sudan as its citizens demand a change in government. Many parts of the continent are in turmoil. Somalia does not have a widely accepted central government. Right now, the Al-Shabab insurgency under the cover of wanting to Islamize the state is causing devastating damage to that country, even venturing into Kenya. Mali is divided into North and South, secession by the Tuaregs led to this partition. Nigeria is fighting the Boko Haram Muslim fundamentalist, who as groups, such as Maitasine Islamist before it caused tremendous damage in some northern parts of Nigeria. 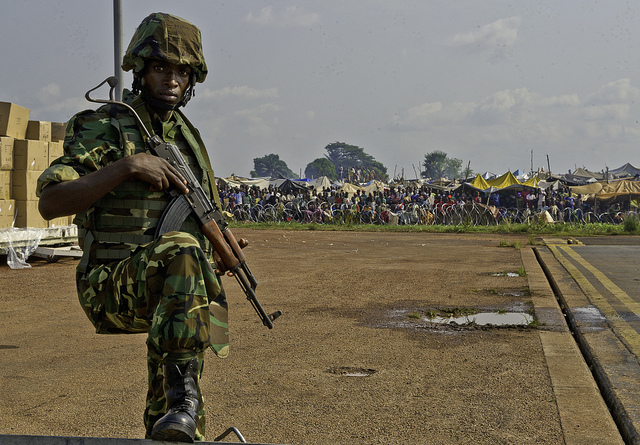 Zaire, Uganda, Congo Democratic Republic, Central African Republic and even Rwanda are all engaged in one form of military violence, insurgency, and banditry. Meanwhile, these security concerns are diverse and complex, ranging from political disagreements to criminal activities with alarming dimensions and consequences that signal to the international community that Africa is not a safe and secure place suitable for economic investment and activities. This is particularly important in view of the efforts being made to create the desired atmosphere to attract foreign direct investment. Apart from the effects of security concerns on the economic fortunes of the continent, the nature of the security challenges facing the continent also has implications for its political system. Social cohesion among various groups and interests is important in the process of national political development. Therefore, the constituent parts of each of the country must be and indeed, feel that they are being carried along in the process of national governance. Since widespread discontent and loss of confidence in the system have ways of affecting national political stability; thus, continuing escalation of violence and crises across the continent will impinge on its survival. Hence, there is a need to rethink and improve on policies and institutional means of dealing with security concerns arising in our continent. Politically, governments should engage in programs of cultural and political education and orientation that seek to enthrone the principles and practices essential for sustainability.